This impressive contemporary tanzanite and diamond ring has been crafted in 18 carat yellow gold. This fine ring displays a feature 3.35 carat oval cut exceptional AAA clarity natural tanzanite, four claw set in subtle relief to the centre of the bold geometric design. The tanzanite is bordered by ten modern brilliant round cut diamonds pavé set to the segmented design. The plain substantial chamfered ring shoulders blend seamlessly with the plain 18 ct yellow gold hallmarked shank. The shank also displays the contemporary engraved inscription "forever". This fine yellow gold tanzanite and diamond ring is supplied with an independent diamond grading report card. The impressive tanzanite gemstone can be purchased separately from the setting for 2500. This contemporary ring is fine quality, set with an exceptional natural tanzanite and very high colour graded diamonds. 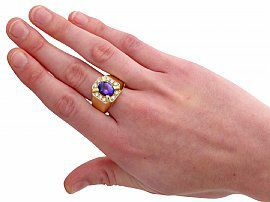 The tanzanite and diamond ring is in excellent condition and the hallmarks to the interior of the ring shank are clear. Length across setting 1.7cm / 0.7"
Width across setting 1.4cm / 0.6"